I started this post on Jan 8th and so many stories intervened in these 2.5 months that the story of the master story teller got missed !! This year, 2016, started off on a great note for us. We had an awesome lunch at the Gnanambiga mess at Narada Gana Sabha. 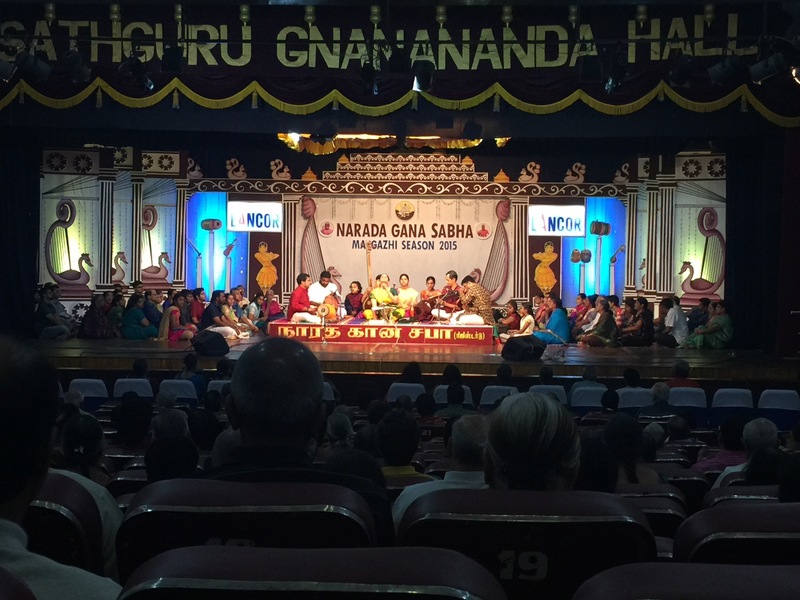 Earlier in the day they had conducted “Radha Kalyanam”… an awesome concept that celebrates the union of the individual soul (jeevatma) with the universal soul (paramatma). So the lunch was a traditional “Kalyana saapadu” (food served during marriages) which was served on banana leaves and was finger licking. We decided then, that one of the reasons we want to visit Chennai during the music season was to eat at Gnanambiga mess. Note – mess in colloquial Indian English means a canteen or a small roadside eatery. Vishakha Hari’s program was at 4 p.m and we got our regular seats in the “o” row. The tickets were more expensive for the same row than any other concert we had attended and rightfully so. Vishakha Hari is reviving the art of “katha kalakshebam” or story telling. Its actually silly to just call it story telling. Its a riveting song and speech performance where the artist helps you “see” the story through his/her words. And Vishakha Hari transports you right where the story is unfolding. 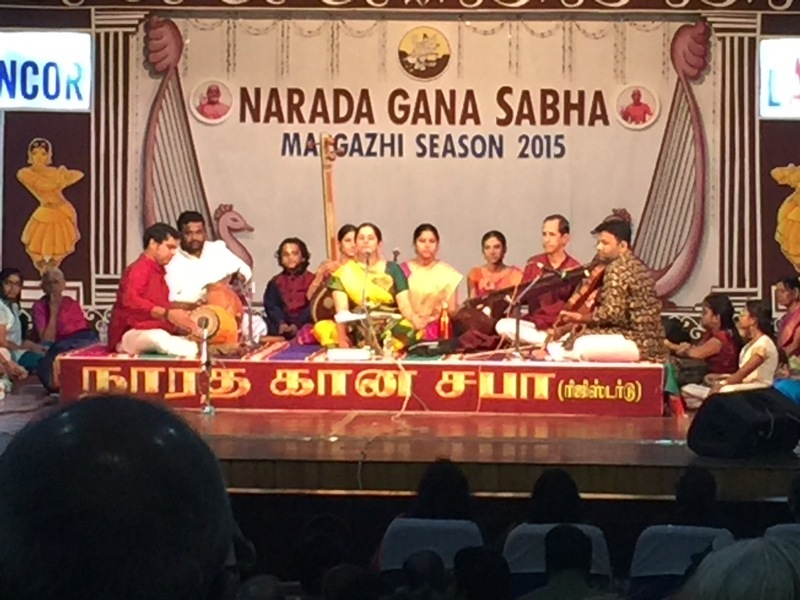 This time she transported us to the marriage of Madurai Meenakshi with Lord Siva. It was exhilarating and felt as though we were all participating in the whole run-up to that wedding. When Vishakha Hari says Meenakshi went coy, as she looked at Lord Siva for the first time … you almost become coy yourself !! Please read about the art of story telling in India and now the western “management” world is discovering the power of story telling – Katha (Storytelling). I wish the various traditions of story telling – Katha Kalakshebam, Burra Katha, Villu Paatu, Hari Katha, Bauls singing, the patachitras of Odisha, all are sustained or revived and sustained because they are a great way of teaching children values and social norms. Vishakha Hari wears awesome 9-yard saris and her Hari Katha is peppered with subtle jokes, she hinted at NaMo and the political situation today. She even spoke of women empowerment and how its spoken of today, but that it was just a normal thing during Meenakshi’s time :). Meenakshi was a warrior and a queen, a very able administrator. No one thought then, that she should be a home maker just because she was a woman. What a powerful insight !! We were mesmerised and enjoyed every minute of “Meenakshi Kalyanam”. Please attend Vishakha Hari’s Katha Kalakshebam whenever you get an opportunity, its time well spent. If you don’t speak or understand Tamil, would suggest going with a friend who does, its no fun otherwise. Some things HAVE changed !